Full truck loads from the Continent to UK, Ireland and back. 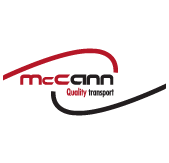 McCann established in 1990 is a Belgian transport and trailer operator. We target all transport from the continent to UK and back. Our main objectives are therefore all transport from Benelux, Germany and France to UK & Ireland and back. McCann offices are strategically placed to serve these destinations using all major roro ports on the Northsea, to and from Uk & Ireland. We operate a fleet of 260 trailers of various types all build to the latest European EN 12642 XL specifications. Lashing and securing gear is adequately provided for each load. Our relationship with trailer & Equipment suppliers allows us to use extra trailers short or long term if required by the ever fluctuating transport demands. Traction is provided with Euro 5 and Euro 6 tractors and new developments on the trailer market are being followed very closely.